Employees in a laboratory often have to handle hazardous or easily ignitable substances. What benefits can networked solutions for storage of hazardous substances bring and what do the technical solutions look like in detail? Everyone is talking about Smart Homes. There are hardly any construction contractors who are not using the latest building technology to convert their new builds into intelligent houses, including control centres with software systems and a wide range of sensors installed in and around the house. At the same time, the issue of control and networking has become well established in the laboratory, too. Software systems are used to optimise performance and safety, and to reduce costs. A wide range of building components are controlled and optimised, for example ventilation, air-conditioning, lighting and fire protection. Ideally, these systems are already taken into account during planning in order to take advantage of the extensive benefits as soon as the building is commissioned and to amortise the investment more quickly. Networked safety storage cabinets: What are benefits? 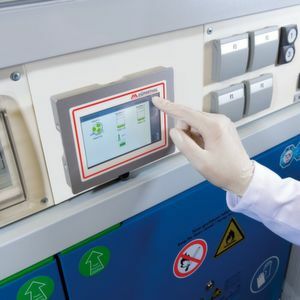 By contrast, despite being an everyday issue in many laboratories, handling and storage of ignitable hazardous substances in safety storage cabinets tends to be addressed on a more ad-hoc basis. This prevents optimum use of available resources for scientific research, development and production. Prompt and safe disposal of solvent wastes alone costs valuable time and hinders optimum laboratory processes. In addition, in scientific research and production operations, there has been a continual increase in each individual’s performance and efficiency requirements. For many people, optimising their own working day and their individual activities plays an increasingly important role (see also LP Info box on page 48). Also, when it comes to occupational safety, operators have more and more responsibilities these days, for example as a result of statutory occupational safety regulations. Factors such as documentation obligations call for stable, safe processes to guarantee sustainable occupational safety. With the Cabi2Net, the German company Düperthal now offers a solution capable of resolving these problem areas. For the first time, safety storage cabinets can be linked to one another in the network, enabling work processes to be controlled. Process reliability is the key concept. Today’s operators are not only responsible for the safety of users and activities throughout the internal process chain; they must also document this and prepare it for further processing using digital devices such as a PC or tablet. Reliable sensors for monitoring the relevant parameters is a fundamental requirement here. Cabi2Net combined with the varied choice of sensors enables processes to be optimised and tailored to the specific requirements on site. For example, fill levels can be recorded at every extraction and/or collection of flammable liquids and appropriate measures can be initiated. The technology also allows temperatures to be evaluated or closing of doors to be monitored. Process reliability is guaranteed and all parameters are automatically documented in conjunction with Cabi2Net for risk assessment purposes. With up-to-date data and intelligent networking, the system also supports efficient value chain design. Information, e.g. on fill levels or faults, can be retrieved on the internet from any device using a web interface. The system is scalable and can be integrated into the general building automation. As a result, it is easy to retrieve relevant information about the operational status of safety storage cabinets, e.g. on a smartphone, tablet or PC, from anywhere in the world. Creating a lean lab can literally begin with just a few steps. A simple method of testing for yourself whether established work processes deliver efficient processing of samples is to count steps. Done on a smartphone, it clearly shows the distances a person travels and how long it takes them on a typical day in the laboratory. Measurements have shown it can be up to seven kilometres, which means around an hour is spent just walking around. By restructuring the working area, distances can often be reduced, thus saving time and minimising the possible risk of contamination of samples. Solutions like these are aimed directly at the requirements experts recommend for optimising work processes. You can’t create a lean lab by simply purchasing a standard product — it’s a philosophy that has to be put into practice on a daily basis. System solutions from Düperthal tailored to specific user and operator requirements are designed to help bring this philosophy to life. Even during the process analysis phase, Düperthal experts ensure that your processes on site become leaner and more efficient. Activities that don’t add value are reduced to a minimum. In practice, the right planning and the right product can achieve a lot, for example preventing a great deal of unnecessary time moving around the lab. It goes without saying that the system solutions always allow work in accordance with the regulations and ensure that users and operators are safe at all times. Particular attention is paid to the potential hazards that arise when using open containers, e.g. for disposal (active storage). These potential hazards include the increased risk of an explosive atmosphere and static charges. Using new technologies like Cabi2Net makes a valuable contribution towards turning the work environment into a lean lab. Düperthal consistently applies the thinking behind Industry 4.0 and IoT, reducing administration work wherever possible. With up-to-date data and intelligent networking, it supports efficient value chain design. Information, e.g. on fill levels or faults, can be retrieved from the network from any device using a web interface. The system is scalable, with additional modules allowing the integration of numerous sensors and actuators. Implementing the results of a process analysis and using Cabi2Net provides the appropriate level of safety in active storage of hazardous substances and frees up resources to leave more time for actual scientific research. Exploiting this potential leads to more stable and leaner processes — entirely in keeping with the lean lab concept.